The North Texas NDEW event again beat (our own!) Texas record for EVs gathered in one place. Over 400 people registered for the event. Twelve public, non-profit, and industry exhibitors displayed their vehicles and chatted with attendees. State Representative Giovanni Capriglione and Regional Transportation Council Member Mike Taylor gave remarks about the impact of electric vehicles on the regional economy and air quality. We also had huge representation from the North Texas Tesla Owners Group, with 47 Tesla Model S's and 5 Model X's registered! 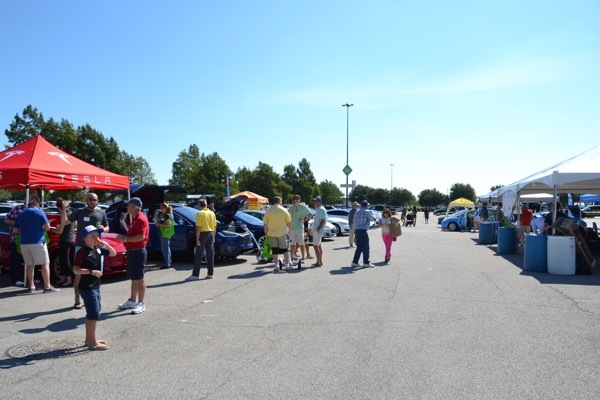 Attendees had four chances to win extended experiences with EVs -- a weekend each with the Nissan LEAF, Chevy Volt, and BMW i3 and 24 hours with a Tesla Model S, thanks to our generous exhibitors, and there were games and food. The hours listed above really represent only day-of work combined from 8 staff members. This event is a MAJOR undertaking for us and involves many hours of planning and coordinating over the course of several months. The big day is upon us! THIS Saturday, September 17th is the DFW National Drive Electric Week Event! Join us from 10am-2pm at Grapevine Mills Mall in the parking lot between Saks OFF 5th and Neiman Marcus -- right next to the electric vehicle charging stations! 10:00am -- Event Opens, Registration: If you've registered online, great! You'll be in the "express lane" to just check off your name and receive the items you'll need for the day. 11:00am -- Elected Officials Remarks: State Representative Giovanni Capriglione and Regional Transportation Councilman Mike Taylor will be saying a few words about the positive impact of EVs on air quality and the Texas economy. 11:20-11:30 -- Official EV Count! Help us beat last year's record of 116 EVs in one place! 1:15 -- Raffles: By visiting our many exhibitors throughout the day and receiving the necessary number of stamps on your stampcard, you can be entered to win AMAZING prizes. Up for grabs this year? A weekend with a BMW EV, a weekend with a Chevy Volt, a weekend with a Nissan LEAF, and 24 hours with a Tesla Model S! Attendees must be present to win, so make sure you stick around! PLUS, make sure to stop by for Pokey O's Cookies & Ice Cream! What else will you find? Activities for all ages, friendly and knowledgeable EV owners, a SnapChat filter especially for NDEW2016, and a Poke Stop in the mall (you never know what you'll find there)! Register for the event NOW! If you drive an EV, bring it (and register it for the event, too)! Promote the event! Whether you are an active social media user, contribute to a print or online publication, or just like to gab, help us get the word out about the event! Be sure to use the hashtags #texasEV, #NDEW2016, and #DFWCleanCities whenever relevant. Check back here often for updated details, event calendar/agenda, and DFW EV news! 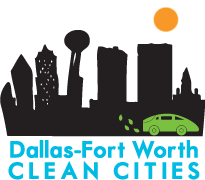 Click the following links for more information about Electric Vehicles North Texas and DFW Clean Cities Coalition. There are currently 404 attendees registered. Registered attendees report 1,814,590 electric miles driven.